Exercise is important to everyone, and especially to students, but with our busy, stressful schedules, we often neglect it. One student of the University of Seoul (UOS), however, has found a way to encourage exercise and to emphasize its importance in a practical way. This summer, that student ? June-hyuck Seok (Dept. of Sports Science, ’11) - posted his ideas about exercise on Daenamu-sup, a UOS Facebook page. Seok was contributing to a discussion about donating talent, but his talent turned out to be quite unique: he was donating information on how to exercise, person to person. 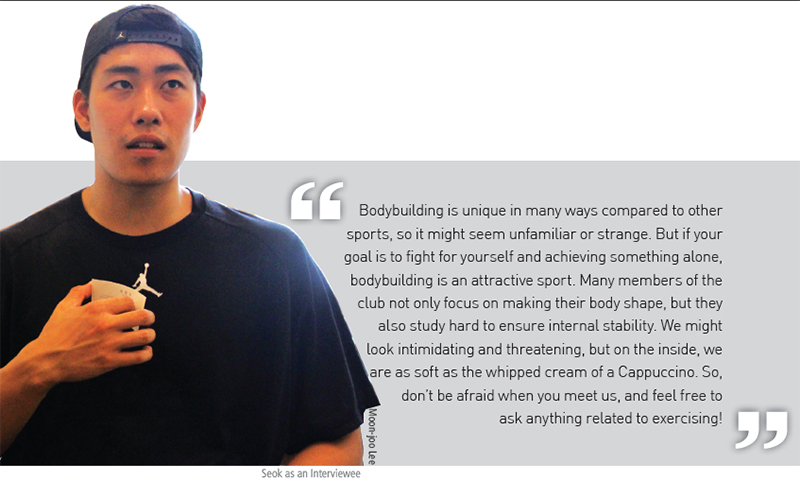 The UOS Times interviewed Seok, a fourth-year student representing The Artistic Body (TAB), a bodybuilding club. Seok posted on Facebook that he wanted to help the UOS students in exercising. He volunteered to work as a personal trainer for students during the entire month of August. There is quite a story behind his generous offer. As he plans to graduate next year, he felt like helping the UOS students who do not know much about taking care of their own bodies, or how to choose which exercise their body needs. Seok said his commitment was particularly strengthened by one class he took, Conditioning caRe Specialist (CRS). The purpose of this class was to foster expertise in fitness by treating body imbalances or pain caused by muscular problems. By helping other students, Seok learned first-hand about many of the various causes of these problems, and students could benefit from his newfound knowledge. Seok said he had worked as a personal trainer in the past, giving him an advantage as a volunteer, and easing his own stress a bit. He spent the whole month volunteering, with about 30 students seeking his help. He said he was surprised at the number of students who were dealing with severe pain due to muscular problems. At first, he hoped to treat these problems holistically, correcting their posture while enhancing their overall health, but before long, he found that he could only focus on correcting their posture and problems. Presently, as his own academic schedule is quite busy this semester, he is only helping one student. TAB is a club for students of Department of Sports Science that was established in 2008. The club has grown quickly, especially these days, with more students joining than in the past. As a leader of the club, Seok told us about TAB with great enthusiasm and passion. TAB’s purpose is to seek physical beauty through weight training and personal exercise programs customized for each individual. The club emphasizes practical skill, culminating in a presentation in late October each year. All members of the club prepare to show their physical achievements on the campus stage. In addition, many members go on to participate in other bodybuilding and fitness competitions. Since body-shaping requires steady exercise, there is no particular length of time for members to focus on fitness. Before the October performance, however, all members go on a diet for two months. Other than this, members continue on individual diets before a competition begins. The club has become quite popular in the Department of Sports Science. Seok thinks there are two main reasons for this growth. One is that many senior members of the club have succeeded in their goals, and they provide a lot of help to less experienced members. Another reason is that the extension of the focus of the club has expanded. In the past, the club only dealt with bodybuilding competition, but these days, they participate in more general fitness competition, as well. This has brought more members including females, who used to avoid such disciplined exercise in the past. There are about 30 members now. Working as a bodybuilder is a tough job, but there definitely are pros and cons. Most of them have a strong attachment to themselves and have established routines. Also, as they design their bodies, they have a tendency to choose only the healthiest foods. But this does not mean that they are always healthy. When preparing for a competition, they go on a heavy diet, which ruins their body. 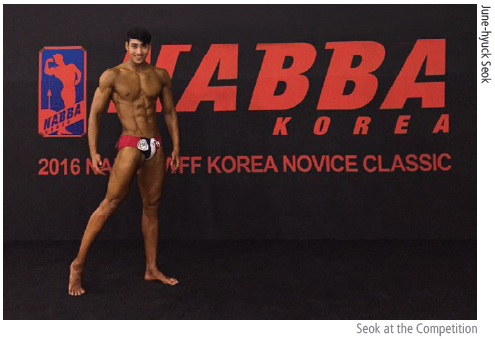 In Seok’s case, he lost 15 kilograms in three weeks and suffered shock because of low blood pressure. This level of discipline puts a lot of stress on one’s body. Another result is that all bodybuilders experience lower immunity, or resistance to illness. After a competition, almost everyone experiences bulimia, as they binge to recover the lost weight and nutrients. During this time, they gain more weight than they lost. Even with these disadvantages, Seok seems to be enjoying his life as a bodybuilder.